Early Friday morning, May 6, 2011, Lucile passed peacefully from this life into the arms of her Lord and Savior. She was 96. Lucile was born Feb. 20, 1915, in Oak, Neb., the seventh child of Benjamin T. and Katie Crandall Coles. The family left Oak in February of 1920 and traveled to Imperial, Neb., where Lucile celebrated her fifth birthday with her Aunt Lizzie. Later they came to the Big Timber area, then to Acton, eventually settling in the Molt area. In 1933 Chris Johnson told his brother C. Allen that Hazel Coles had a younger sister and Allen should meet her. From that time on, they were together and on Feb. 10, 1934, they were married in a double ceremony with Allen's sister Velva and her husband, George. 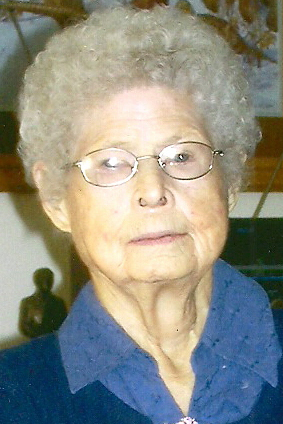 Lucile is survived by C. Allen Johnson, her husband of 77 years; two sons, Larry (Audrey) Johnson and Duane (Wilene) Johnson; five grandchildren, Terri (David) Kelleher, Mark (Katie) Johnson, Richard (Melanie) Johnson, Tamala Lucas (John), Jeffrey Johnson, and two step-grandchildren; seven great-grandchildren and two step-great-grandchildren; and two great-great-grandchildren. She was preceded in death by her parents; five brothers, Ross Coles, James Coles, Lester Coles, Alfred Coles and Albert Coles; and three sisters Leota Belcher, Hazel Leuthold and Bernice Boddy. Funeral services will be held at 11 a.m. Wednesday, May 11, at Smith West Chapel, located at 304 34th St. W. Interment will follow at Terrace Gardens Cemetery. Visitation begins at 5 p.m. Monday, May 9, also at Smith West Chapel. Memorial donations can be sent to the charity of one's choice.